If you're a musician or band, and you need an audio disc copied and printed 50 times with a plastic sleeve for promo, or a full CD Jewel Case with a digitally printed booklet and inlay produced on our Xerox Digital Printer, we can help! 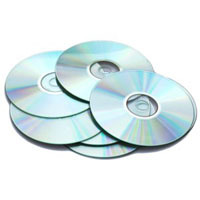 If you need anywhere from 50 to many thousand CD-Rs digitally printed and duplicated, we have the capacity to meet your CD production requirements. A CD-R disc holds up to 700Mbyte of data or audio data, so can easily contain your business brochures in a PDF format or even your whole website! Here at Media Matters Technology, we only use JVC/Taiyo Yuden media - the best CD-R media available, providing a superior printable surface for vibrant colours, and a data integrity that will allow your discs to be used and enjoyed for many years to come. Whilst our CD Duplication and Printing services are normally suited for production runs up to 1000 discs, we can easily accommodate much greater numbers - Our CD Replication service is the more efficient and cheaper option for larger runs, but production can take more time than you may have available, so please call us to discuss all of your production requirements. Please visit our Supplying Artwork page where you can download information on how best to supply your artwork to us. Alternatively if you have not created your own artwork for your CD, for a small fee we can be of assistance to you. As with CD duplication, our DVD Duplication services are carried out in-house and to the highest of standards using JVC/Taiyo Yuden CD-R media.